Classic beef tacos are taken up a notch with the addition of Sriracha in these Sriracha beef tacos. Back in November of 2011, I introduced Taco Tuesday posts to the blog with these tacos. That was almost 6 years, and over 100 taco posts ago. ONE HUNDRED TACO recipes, you guys. That’s…crazy. But I am crazy for tacos. 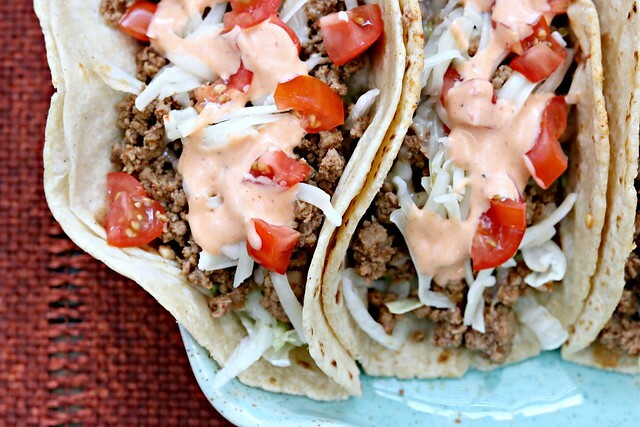 And the reason this one won out as the front-man for Taco Tuesday posts was because it was a basic taco recipe that everyone could love, with a few…upgrades. Mainly the addition of Sriracha, hence the name. Something just a little different, that I was inspired to make after making the Sriracha burger for a recipe swap group I was in back then. It’s one of those recipes that shows you that just the slightest change can make a classic dish into something phenomenal. And believe me, these are definitely phenomenal. And like many tacos, one of the great things is that you can make adjustments to make it work for you. Different toppings, less Sriracha if you don’t want it too spicy, different tortillas or shells, etc. I like the basic-ness of these tacos. The simple toppings that let the beef and the sauce shine. The shredded lettuces gives a nice crunch, which is something I always love to have with my tacos, either with the taco shell or the toppings. Crunch is good. Texture balance is good. These tacos are great. But don’t take my word for it. Try them for yourself. Heat olive oil in a skillet over medium-high heat, add garlic and shallot and cook for 1-2 minutes, until softened. Add sirloin, breaking up with a spatulas it cooks, until browned. Add water, chili powder, cumin and 2 tablespoons of Sriracha to sirloin mixture. Stir, reduce heat, and simmer for 5 minutes. 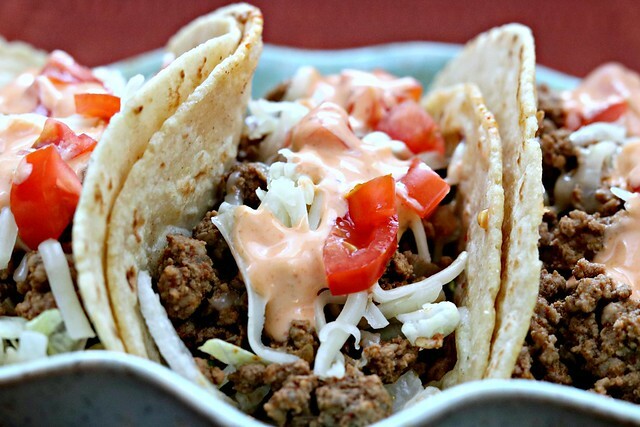 While taco mixture finishes cooking, combine ranch dressing and remaining 3 tablespoons of Sriracha in a small bowl. Set aside. 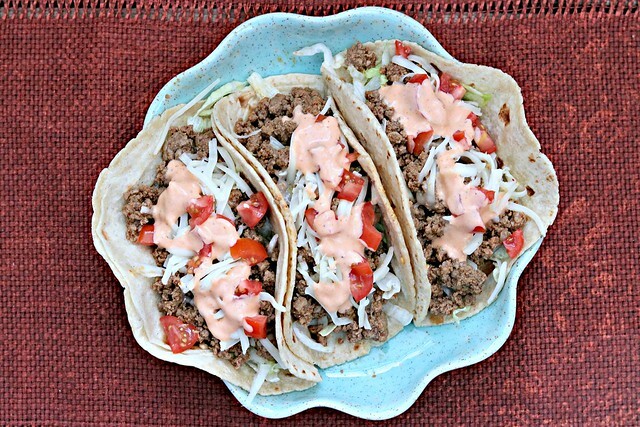 To assemble, warm flour tortillas fill with lettuce, beef, cheese, Sriracha ranch, and tomatoes. *Sriracha is pretty spicy, so adjust the amount according to your tolerance level. If you don’t do well with spicy, you may want to test it 1 tsp at a time. This recipe inspire me for trying something new for Tuesday. Thanks for sharing this recipe.